Designed with the ground crew or student pilot in mind, the easy-to-use ICOM A14 is compact and rugged enough to withstand daily wear and tear. With all the noise in the cabin and on the tarmac, it is important to have loud, ringing audio. The ICOM IC A14 S cuts through noise with a BTL amplifier that doubles audio output, providing crystal clear sound. Built for the rigors of ground use, the ICOM IC 14 S boasts a strong, water resistant casing, ultra portable light weight, and a Lithium-Ion battery pack that lasts up to 18 hours. The transceiver has a simple keypad for quick and easy operation, as well as the popular and exclusive red emergency button found on most ICOMs. 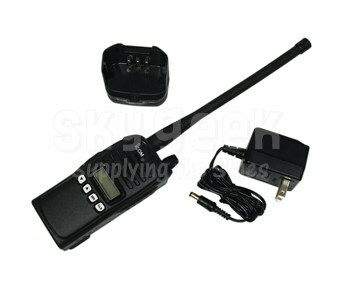 This is a basic handheld transceiver for those who do not need excess features and want a simple, intuitive device. It's affordable, versatile, and when you order your ICOM A14 S from SkyGeek.com you'll get grounded prices. Packaged for maximum mobility, the ICOM A14 S will arrive with a flexible antenna, battery pack, belt clip, hand strap, battery charger and AC adapter. 2 Lithium-Ion Battery pack-1 Ea.